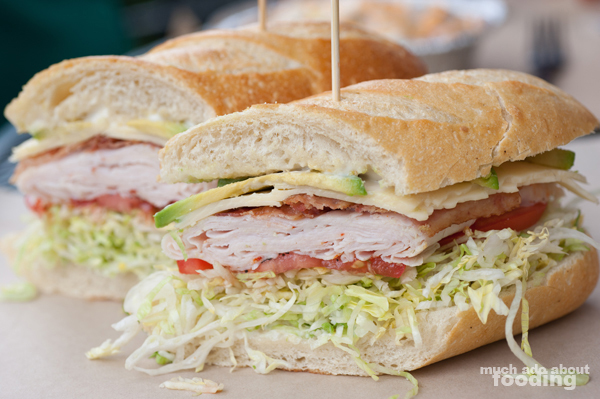 People swinging over to Orange County from the east coast might have missed seeing delis commonly around but they could just look over to Tustin and Anaheim for a taste of that at Bronx Sandwich Company which attempts the style with a little bit of California influence. The menu emphasizes their hot pastrami and other typical New York deli fare, and they piled the Dietz & Watson deli ingredients on high between deliciously crusty-yet-fluffy bread by OC Baking Company. It seems like their communities have really taken to them as well, providing quality hefty sandwiches for lunch and dinner with some new breakfast selections offered too. We were invited in for lunch one day to check out all of the tastiness they had to offer. 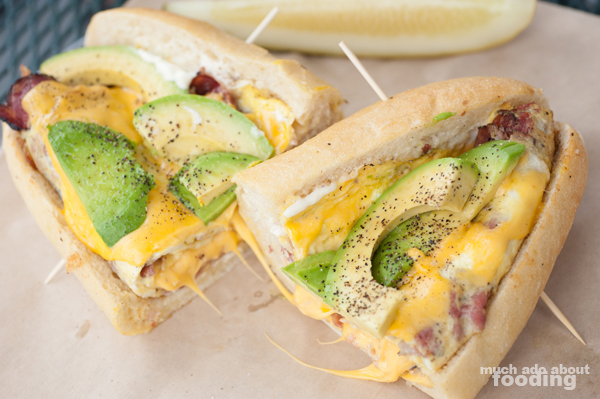 The Breakfast Sandwich ($8.99 - eggs, avocado, bacon, pastrami, and cheese) selections are available all day and read like any configurable breakfast plate with variations of bacon, sausage, pastrami, etc piled together with eggs and cheese. It is hearty and can easy fill you up in the morning or when you have that brinner craving. We liked how the eggs were presented in an omelette style, folded over for easy sandwich stacking and biting with falling all over the place as scrambled eggs would have. It's definitely one that will keep you going for a long while. However, if you are aiming for heartiness during lunchtime, you can grab the heaping, popular Sloppy Bronx ($10.99 - thinly sliced beef, all beef hot link, melted American, Swiss, and Pepper Jack cheese, crispy fries, coleslaw, and spicy mayo) which is a monster of a sandwich with its piled-high fries. 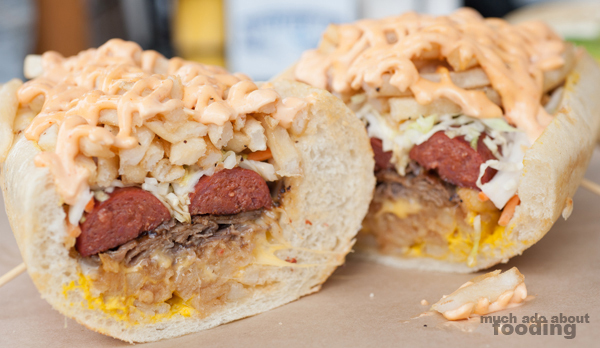 As if you needed more weight to each bite, the heaping of fries and generous drizzling of thick mayo make the Sloppy Bronx a loaded sandwich that pays tribute to loaded hot dogs. You would have to eat this one fresh for full effect though because the fries will get soggy under the sauce. 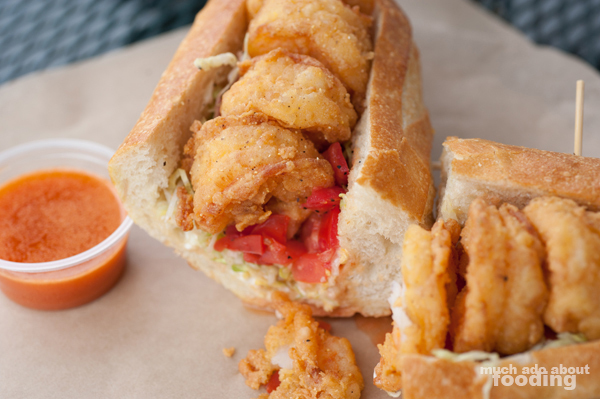 Opting for a lighter run, you might shoot for their Shrimp Po'Boy ($12.99 - jumbo shrimp, house butter sauce, lettuce, tomatoes, and mayo), another beast of a sandwich that did not wimp out on the number nor size of their shrimp. Big, bold, and beautiful, each curled crustacean had just the right amount of cornmeal batter enveloping it before being deep-fried and stacked tight. This was actually my favorite sandwich of the whole visit because of the bright flavors with the authentic po'boy feeling from the shrimp themselves. If you wanted to douse on some more richness to your sandwich, you can also get a side of their house sauce which is a seasoned, melted butter. Despite their providing of a pretty good po'boy in a county where I can't find many, what Bronx is more known for with their typical clientele is their pastrami so we went on to grab their Pastrami Reuben ($10.99 - hot pastrami, Swiss cheese, Thousand Island dressing, and sauerkraut) on marbled rye. 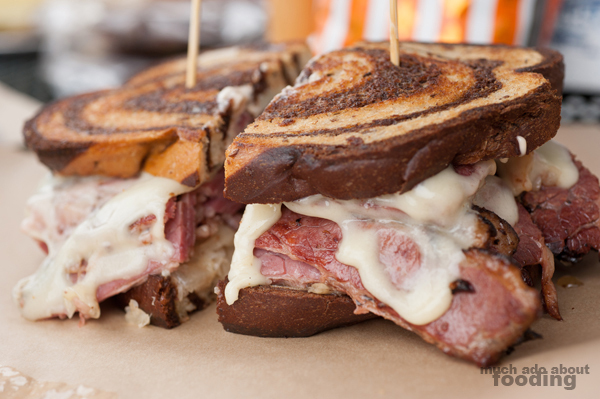 Their pastrami sandwiches, of which there are many variations, come with different quantity options that start at their standard half-pound of meat to three-quarter and even full pound. It was certainly flavorful and highlighted well with the sauerkraut beneath. 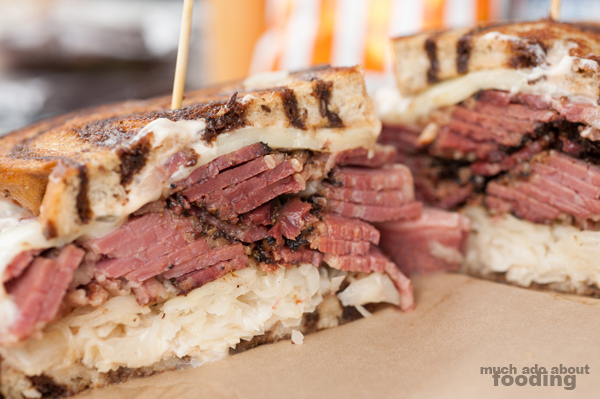 If you are gunning for the reuben, don't forget to load up on the napkins because the hot pastrami was so juicy that it ran everywhere. Another popular sandwich but on the different end of the spectrum in terms of sandwich styles is their Bronx Club ($9.99 - golden turkey, creamy Havarti cheese, crispy bacon, avocado, lettuce, tomatoes, and mayo) which I really enjoyed. Every sandwich shop needs a solid club sandwich, and Bronx really delivered here. The lettuce was crisp and bounteous, adding lovely texture to the soft turkey slices and smooth avocado. All of the pieces fell into play in a balanced way, and the bread just brought everything together perfectly. Now, if the sandwiches don't fill you up for some reason, you could also indulge in their loaded fries - foil pie tins of fries smothered heavily with any assortment of accompaniments. We tried out the Spicy Alabama Fries ($8.99 - all beef hot link, melted jalapeno Jack cheese, grilled bell peppers, grilled onions, grilled jalapenos, and spicy mayo over crispy fries), an order that was a meal all of its own. 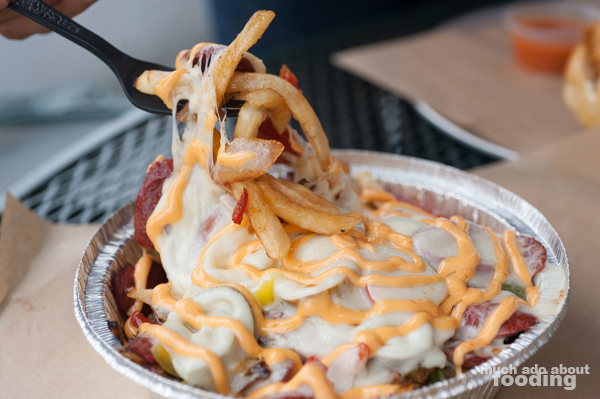 Another popular version is their Manhattan Street Fries which uses string fries and has American cheese. Since they're aiming for the New York deli feel, expect other sandwiches on their menu to represent those classics such as ones called The Mobster and The Philly Cheese. They also do give a nod to west coast sandwich preferences though; they offer options like their Caprese sandwich and The Babe, a turkey cayenne-pepper cheese ensemble. 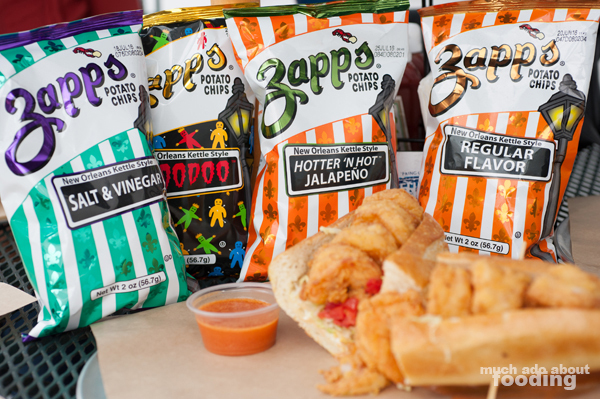 In keeping with the east coast deli feel, Bronx Sandwich Company also offers chips with your sandwiches but very particular ones - Zapp's, an east coast favorite. Dessert can come in the form of authentic Black & White Cookies shipped from New York itself! If you're interested in visiting Bronx for some sandwich loving, find them at 13041 Newport Ave, Tustin, CA 92780 and 949 S. Euclid St. Anaheim, CA 92802. Don't forget to bring your appetite.